Mc Kayla Maroney, Jordyn Wieber, Gabrielle Douglas, Alexandra Raisman and Kyla Ross of the United States celebrate on the podium after winning the gold medal in the Artistic Gymnastics Women's Team final on Day 4 of the London 2012 Olympic Games at North Greenwich Arena on July 31, in London, England. 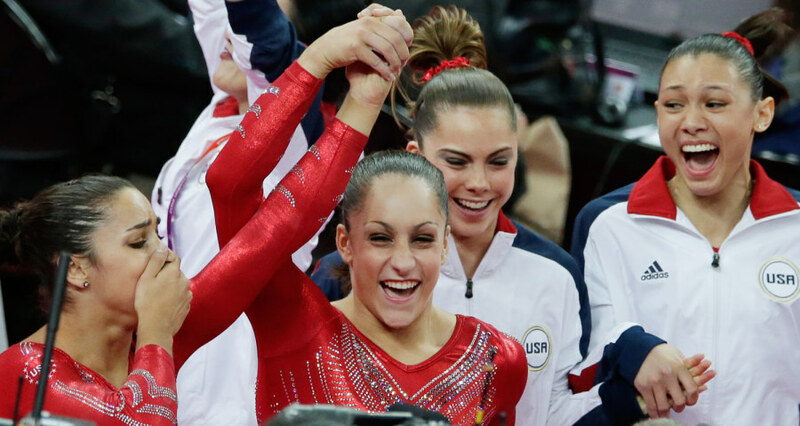 U.S. gymnast Jordyn Wieber, second left, lifts up the hand of teammate Alexandra Raisman, as they celebrate along with McKayla Maroney and Kyla Ross after being declared winners of the gold medal during the Artistic Gymnastic women's team final at the 2012 Summer Olympics, on July 31, in London. 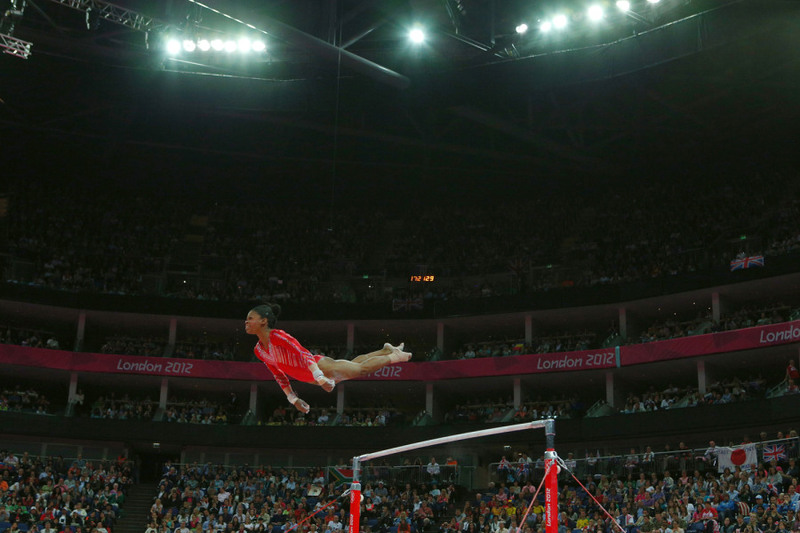 Gabrielle Douglas of the United States of America competes on the uneven bars in the Artistic Gymnastics Women's Team final on Day 4 of the London 2012 Olympic Games at North Greenwich Arena on July 31, in London, England. 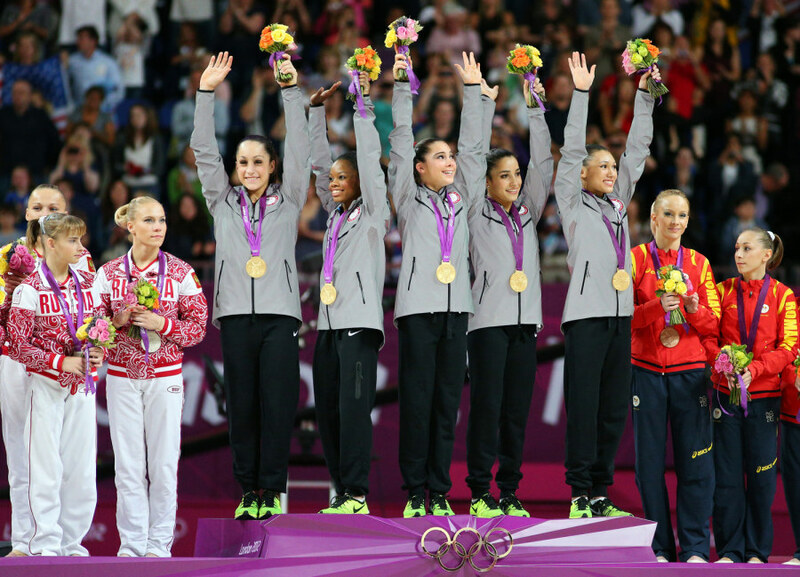 AP reports -- LONDON - The Americans lived up to the hype and then some, winning their first Olympic gold medal in women's gymnastics since 1996. Won it in a rout, too. Their score of 183.596 Tuesday night was a whopping five points ahead of Russia. Romania won the bronze medal. Read more on their win here. USA's Jordyn Wieber competes on the uneven bars during the women's Team Final at the London 2012 Olympic Games Gymnastics competition on July 31. 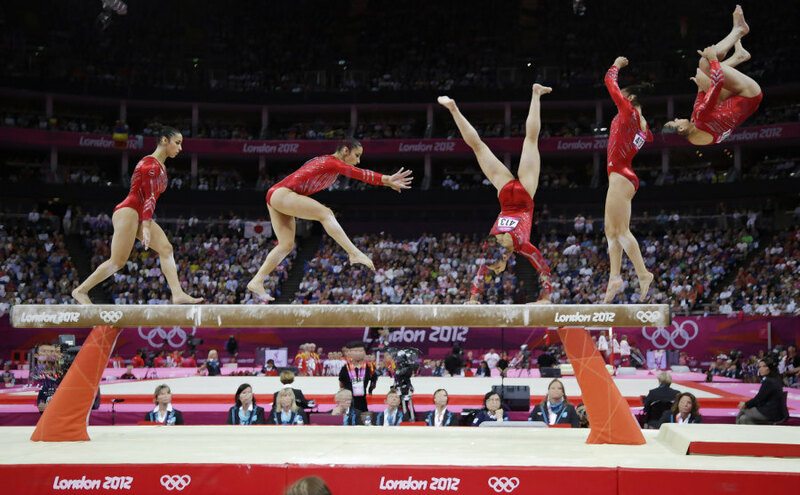 In this multiple exposure photo, U.S. gymnast Alexandra Raisman performs on the balance beam during the Artistic Gymnastics women's team final at the 2012 Summer Olympics on July 31 in London. McKayla Maroney of the U.S. is embraced by a coach after performing on the vault during the women's gymnastics team final in the North Greenwich Arena at the London 2012 Olympic Games on July 31.